This picture sums up everything I feel about this figure. 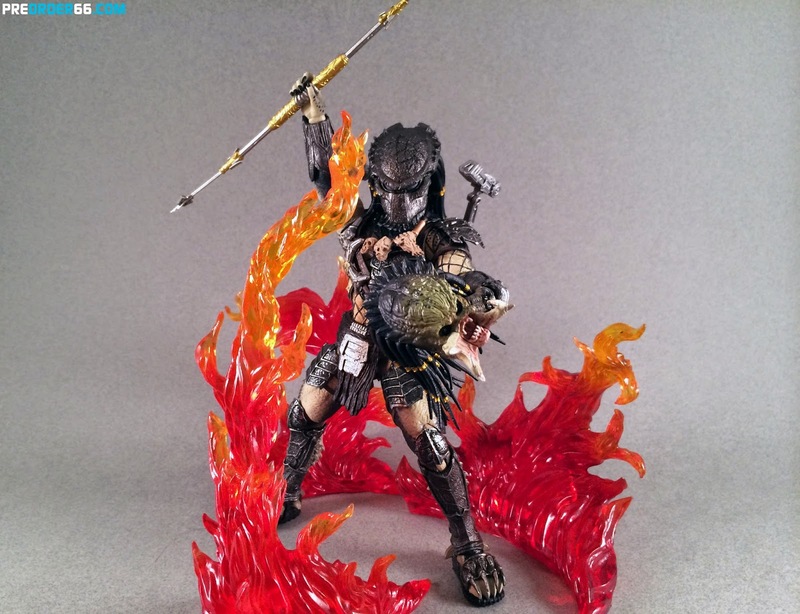 So, we're back again looking at the AvP:Requiem Wolf predator. This is going to be a slightly condensed review, because this is literally the same figure I REVIEWED RIGHT HERE when it came out a few months ago. Only he has new weapons. And a slight darker paint job. And most of my feelings towards the base figure haven't changed. One of the major additions to the toy is the claymore(they call them that in the instructions, no joke) mines that are slung across his chest. They do look like the movie ones, so that's cool. The necklace gets in the way of the new mines though, which is annoying. He also utilizes the belt clips that went unused on the first version, for the shuriken like objects. They fit well enough and only popped off a few times during the shoot. Also they dropped the bigger med kit backpack and swapped it for a spot to put the spear. And threw in the second plasma caster he uses. Boom, double headshot. They both swivel up and get into position just fine. They also share a mold. The aforementioned mines do pop off the belt and Wolf can hold them so you can make it look like he is in various stages of use. The shurikans, in open and closed forms. The closed ones are actually two separate sculpts, with on hanging a bit lower to be placed further back on the belt. That was a nice touch. And he has a new set of hands meant to better hold them, but it is a bit of a loose fit. He also has the other hands from the first release, fists, splayed open, vial holding hands, and weapon handle holding hands. speaking of reused accessories, he has the fully extended whip and spear. Not pictured are the extended wrist blades, and the blue vial. Those are here too. And a plasma caster gun! One of the cooler moment in the movie is when he builds a broken plasma caster into a hand gun for him to use. And it looks exactly like that. it fits into the hands just fine. 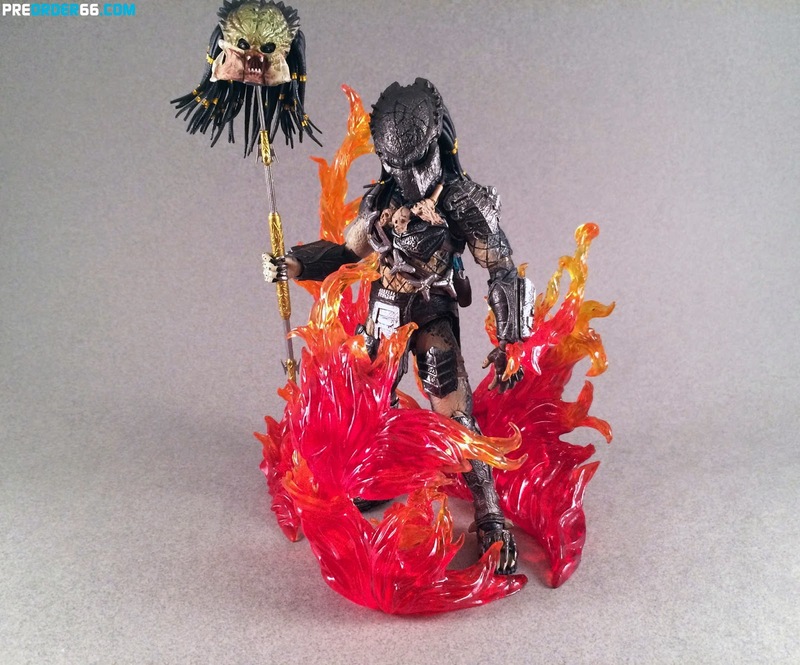 And honestly a predator looks both cool and wrong holding a pistol. I dig it, though. The Other head, with both open and closed mandibles still retains all the things I disliked about it from the other release. The masked sculpt is the way to go on this guy. but they did include it if you wanted to swap it out. 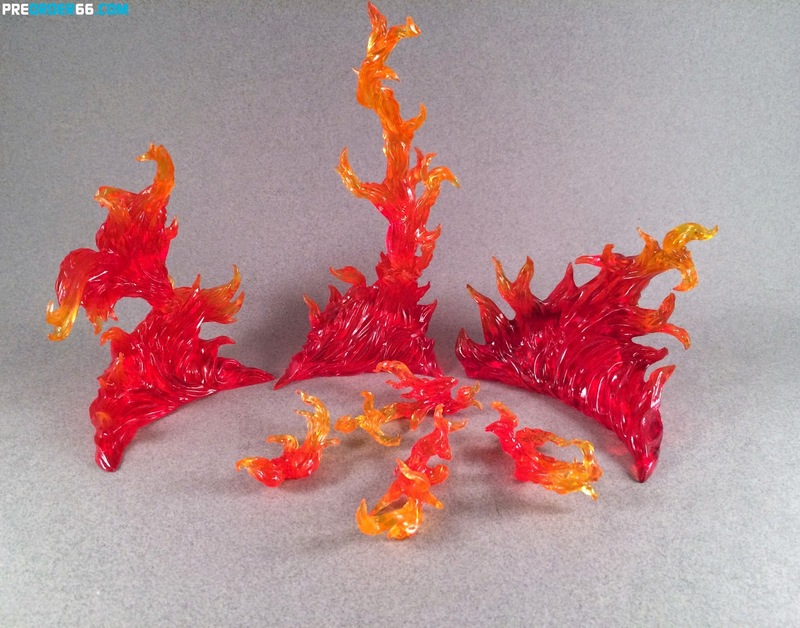 Look at those fire effect pieces!!!! This is a separate pack, that comes in red or blue, and is meant to be a add on for the displays you have your figures in. It has three large sections, and then four smaller ones meant to wrap around the hands/ankles of the figures making it look like the flame not only engulfs them but they are fighting through it. The flame sculpt is also fantastic, looking like organic flowing flame sand not just weird chunks of red and orange. When combined all together it really adds to they dynamics of a display, and even manages to make the Wolf here a bit more badass. Also it's articulated. Two of the sections have pieces connected by large ball joints so you can remove them, swap them, or position them differently to help add to the scene. They pop in and out pretty easily. Man this Predator. I had my complaints about the other one and most of them ring true here. His one didn't have the diecast knee-pads falling off, and the slightly darker colors look better. But why two releases? All these accessories should have been packed in with the first one. If you didn't buy that one, and are still interested, get this version, it is the better of the two, honestly. Grab him right over here. These toys were provided courtesy of Tamashii Nations and Bluefin.